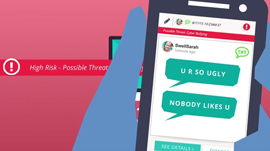 A new service called Bark will act as an online watchdog to protect your child from online predators and cyberbullying, as well as looking out for mental health concerns like depression or suicidal thoughts. Using deep learning and GPUs hosted in the Amazon Web Services cloud, Bark scans through social media messages and alerts parents of potential problems by flagging keywords and even analyzing the context around a conversation – it knows when someone is jokingly saying “ugh, I hate you” (for example, because the child just got a new, cool game) versus when someone actually means it. “So much socialization happens through connected devices. As a parent, that raises the question of how you keep them safe in that environment, but still let them explore and harness the power of technology,” CEO Brian Bason explains. Since its soft launch a few months ago, Bark has analyzed more than a million messages, and found that 52 percent of its user base had at least one problem identified via its software.